Madara is one of the first natural and organic brands I tried eight years ago now and it firmly became a favourite, so I was pleased to see it recently had a little make over and that they have released a new line. Madara as a brand originates from Latvia and ingredients from the Northern Hemisphere are at it’s heart, it also has a beautiful Scandinavian feel to the much of it’s branding. 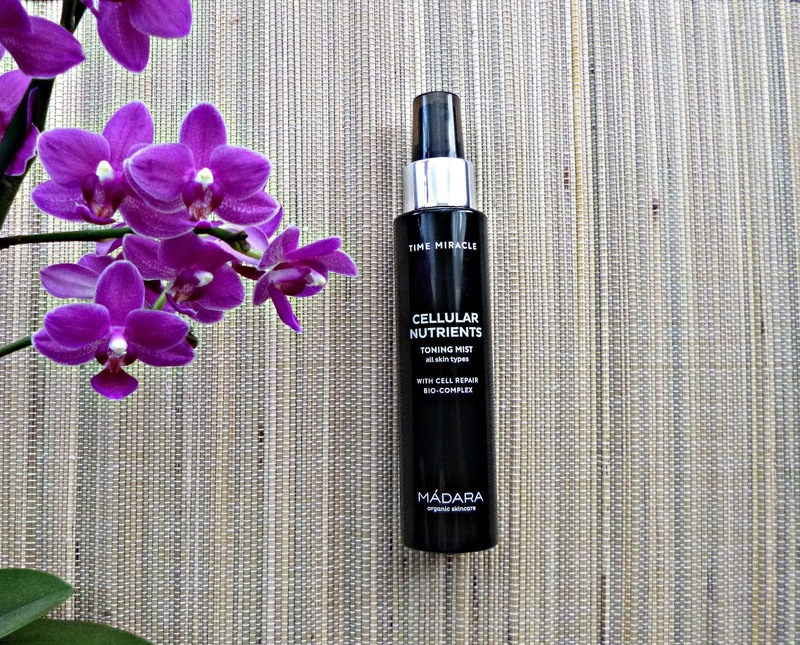 The new Time Miracle range is Madara’s offering for ageing skin, although this Toner, the Cellular Nutrients Toning Mist (£20 for 100 mls) is suitable for all skin types. Madara have replaced water in this formulation with Birch hydrolate, an ingredient which is popping up everywhere, replacing coconut water as the new it drink. This toning mist gives a healthy dose of moisture thanks to the Aloe Vera, glycerine and hyaluronic acid (this toner isn’t alcohol free though, as I know a lot of you avoid it). It has a spray nozzle so you can spritz directly on to the face but personally I found it wasn’t the most gentle spray and so prefer to spritz it in to the palms of my hands and press gently in to the skin. The Birch itself is part of Madara’s cell repair Bio-complex which they claim improves skin structure and collagen synthesis. It’s always very hard to review anti-ageing products because it takes longer than a few weeks to see long term results, but after using this product for about six weeks I love how hydrating it is and reach for it often. I was also very impressed with the visuals used for the campaign, it’s nice to see brands embracing an age confidence, love your skin message and using models that reflect this. There are six products in the Time Miracle range but lot’s more Madara products to explore. This product is Ecocert certified organic and vegan. Previous Post Summer nails with Pinks Boutique and a giveaway!